Park Elementary School fourth-grade students learn how to log in and access school computers during technology class on Thursday. 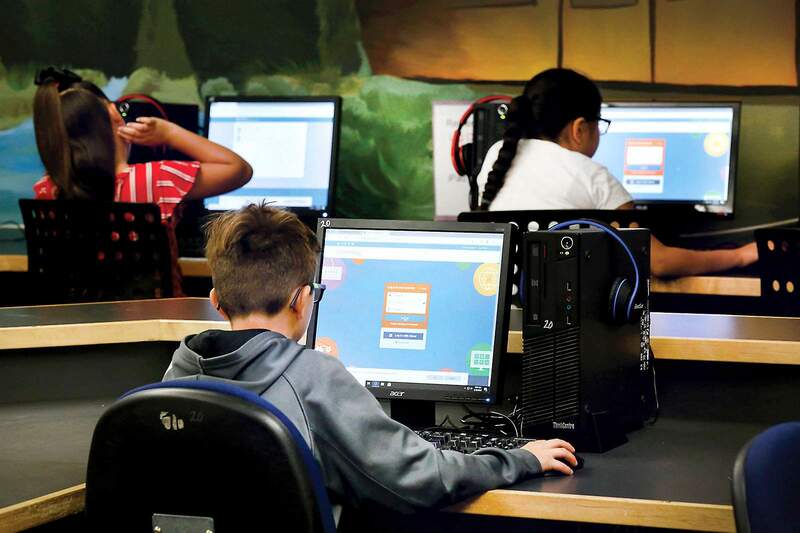 Park Elementary used a new math curriculum last year, and standardized tests showed the curriculum helped students improve their math skills. It’s often said standardized school tests are a snapshot – “one day, one test” – and too much weight is put on their results. 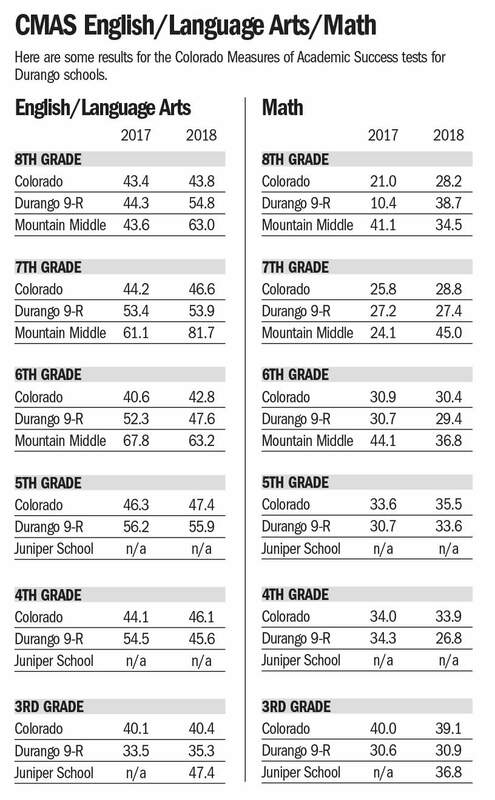 But Durango School District Superintendent Dan Snowberger said analyzing the data leads to improvements. A single test on a single day has limitations, but the data provide guidance to the district and school levels all the way to individual students. “It’s a data point, an important one, but we have other data as well,” Snowberger said of the release of the Colorado Measures of Academic Success results last week. CMAS are standardized tests used by the state to assess the academic proficiency of students from third grade through eighth grade. Some tests are also given in high school in math, science and social studies. Jackie Oros, 9-R’s chief student officer, told the Durango School Board, district officials will drill down into the CMAS data for the next two months and present their findings to the school board in October and November meetings. “We’ve conducted a preliminary analysis of data, and we continue to outperform the state in many levels, but growth is pretty stagnant. We’re flat this year,” she told the 9-R Board of Education. She added, 9-R, like many school districts across the nation, struggles to eliminate achievement gaps for minority students, students with special needs and students receiving free or reduced lunch. “We need to examine, especially in subgroups of students, if we are supporting the academic achievement of all students,” Oros said. She also cautioned that comparing scores across years is difficult because the test has changed. 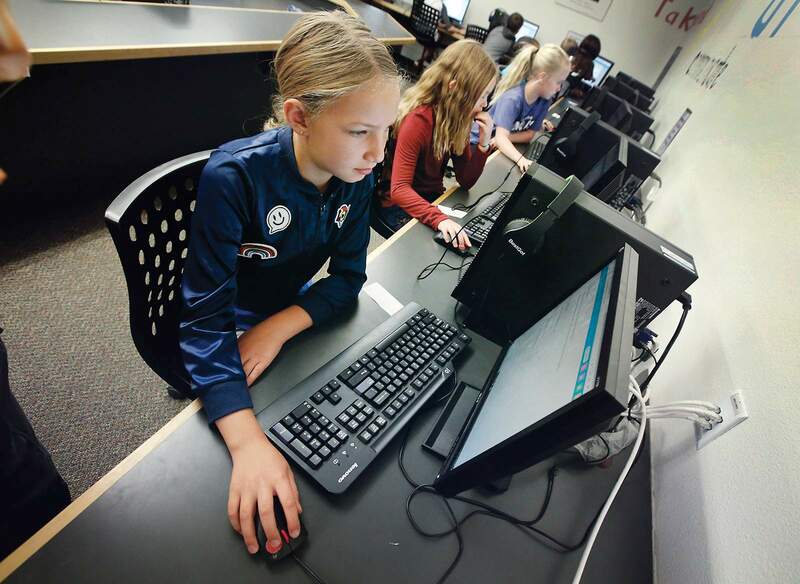 In 2018, students were given CMAS tests, which are Colorado’s version of the Partnership for Assessment of Readiness for College and Careers, or PARCC, exam that is used by a number of states. In 2017, the students were given the PARCC exam. Beyond the individual data provided by the scores, Snowberger said the sheer amount of data from across the state helps individual schools improve. “A lot of people feel testing is bad, but when you get that level of data to analyze where you are at, I think that’s good,” Snowberger said. He said CMAS and SAT measures from around the state can lead to improvements across districts. H H HFor 9-R schools, math remains an area of concern, with better performance seen in English, science and social studies. 9-R schools have identified math as a weakness. The math curriculum was changed several years ago, but improved performance lags. “We haven’t seen the results we wanted,” Snowberger said. In third grade, 30.9 percent of 9-R students met or exceeded expectations in the CMAS tests compared with 39.1 percent in the state. In fifth grade, 33.6 percent of 9-R students met or exceeded expectations compared with 35.5 percent of all students in the state. The good news is that in eighth grade, 38.7 percent of 9-R students met or exceeded expectations in math compared with 28.2 percent in the state. Park Elementary School proved a bright spot, showing growth in math scores. Third-graders improved their math scores by 16.2 percent from 2017, fifth-graders improved scores by 10.4 percent. However, fourth-graders’ scores fell by 6.8 percent. Park Elementary used a new math curriculum last year, and after one year of positive results, Snowberger said other elementary schools in the district can examine Park’s success to see if changing curricula would benefit them. “Now, we can do a deeper analysis to examine if changes made at Park would make sense at other elementary schools in the district,” he said. Improving math skills has also been a focus at Mountain Middle School, said Head of School Shane Voss. This year, the school has adopted a math curriculum that dedicates more time to applying math skills to real world applications. Students use math skills to determine a trajectory of a rocket or the speed of a roller coaster, in addition to more traditional math lessons. “You don’t want to just learn skills, but you want to see implementation of those skills,” Voss said. The hands-on experiments that require use of math skills, he said, also fits in well with Mountain Middle School’s project-based learning model. H H H The good news for 9-R schools is that students are frequently exceeding state averages in English, social studies and science. For instance, in eighth-grade science, 39.6 percent of 9-R’s students met or exceeded expectations compared with the state average of 31.2 percent. At Mountain Middle School, 48.1 percent of students met or exceeded expectations. Park Elementary School fourth-grade student Simone Kelly, 9, learns how to login and access school computers on Thursday during computer lab. Simone is the daughter of Marie Jarvis-Rolfing and Kynan Kelly. In science, 43 percent of all 9-R students tested in all grades met or exceeded expectations compared with 31.2 of all test students in the state. At Mountain Middle School, 47 percent of students met or exceeded expectations. “Our performance in social studies and science drastically outperforms the state,” Snowberger said. While CMAS tests science and social studies only in the fifth, eighth and 11th grades, less frequently than English and math skills, Snowberger said they are areas that are not sacrificed in 9-R curriculum. Also, data produced by CMAS in an array of English standards show 9-R students outperforming state averages. H H H SAT and PSAT scores also show by the time 9-R students are leaving the K-12 system, they are out performing the state average. 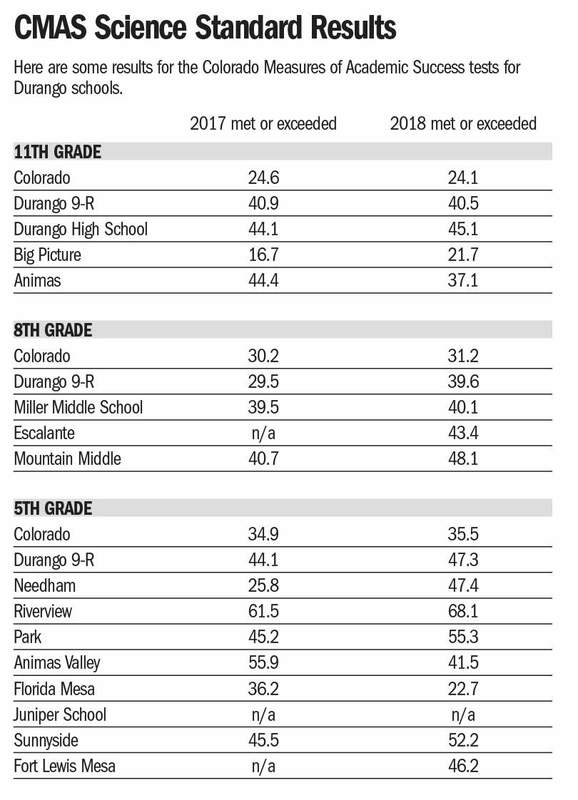 The average SAT score in Colorado for all students in 2018 was 1,014. 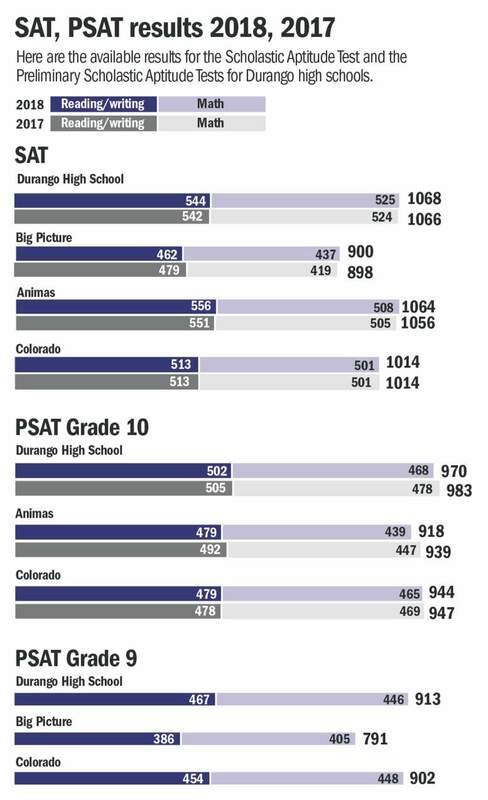 In all 9-R schools it was 1,044, at Durango High School it was 1,068 and at Animas High School it was 1,064. Sean Woytek, head of school at Animas High School, said students have “skin in the game” when they take the SAT, as most colleges and universities use the scores as part of their admission process. He noted a few institutions have begun dropping their use, such as the University of Chicago. But with the SAT still key in gaining admission for most colleges, he said students take a keen interest in the test. In Animas High School’s project-based model of teaching, Woytek said students receive a lot of “authentic assessments” outside of traditional testing. Typically, students will push for taking some time away from their projects to prepare for the SAT, he said. “We’re teaching kids to be critical thinkers, and they know what they need to be successful, and they will advocate for their needs,” he said. About a month before the SAT is administered, AHS will devote time to prepare students for what they will see in the SAT. “It’s a fine balance preparing students for the tests and also preparing them for college and post-secondary success; sometimes they are mutually exclusive,” he said. H H HWhile educators have mined data for improvements for decades, in future years, 9-R parents may also receive more detailed report cards. 9-R is moving to a personal competency-based learning system that Snowberger said will set higher expectations for students while modifying some traditional aspects of school life. Over the long term, Snowberger said letter grades in subjects might also be accompanied by a more detailed report on each student’s individual skills with more indicators of areas of strengths and weaknesses, a bit like the data provided by CMAS to schools. In addition, students will be given more flexibility either to move ahead to more advanced classes if their skills warrant or to take more time acquiring skills if they need extra assistance. “We’ve always done that with high school, but we’d like to expand that to elementary and middle schools,” he said. 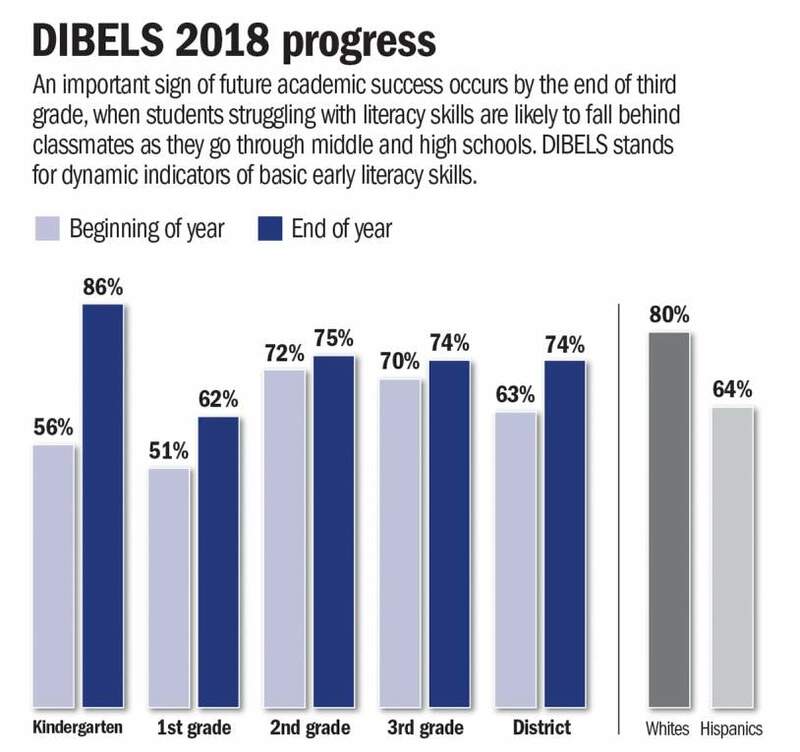 What that might mean, Snowberger said, is a fourth-grader working at the fifth-grade level on one skill while spending more time at the third-grade level on another skill he or she finds more challenging. “We need to engage individual students in ways that they learn best, and that may mean taking a couple weeks longer in one subject, while moving more quickly in areas they have demonstrated proficiency,” he said. The changes won’t happen without input from parents, students and the school board, but it’s a conversation 9-R will begin this year and will likely extend over several school years, Snowberger said. “We want to ensure it makes sense to parents, and it’s not a curveball to them,” he said.